Home » News » Is Your Goal to Improve Operations, How About a Robot Palletizing System? Eliyahu Goldraratt in his book, The Goal, stated “Productivity is meaningless unless you know your Goal.” Most companies seeking a robot palletizing system have as their primary goal to reduce operating costs. Reducing operational costs combined with increasing flexibility, balancing production line throughput, or increasing personnel safety will help a company become more competitive. Robot integrators like S&R Robot Systems located in Texas can assists how a robot palletizing system can help improve goals such as these. Flexibility is a strategic advantage with robot palletizing systems. Companies manufacturing various products on a single line or packaging in various containers can automate this process with a robot system. End of arm tools (EOAT) are custom-designed to handle a wide range of products, from boxes and bags, cartons and cases, to pails and pouches, kegs and barrels. An EOAT can be swapped automatically, allowing a single robot to palletize 50lb bags and 55 gallon drums virtually seamlessly. Not only can a robot palletizing system palletize various product types, but it’s flexible enough to expand with a growing company that is continually adding new products. Growing companies must be able to quickly expand or retool for new products. Retooling a robot palletizing system can be as easy as programming new stack patterns on a pallet. In addition, a robot can be redeployed to operations other than palletizing. If production can benefit with manufacturing flexibility, then a robot system is a good solution. A balanced, high performance production line has little or no bottle necks with throughput. Many companies have to contend with business cycles and finding a balance with regard to manual labor; needing to hire new employees or contractors when sales are above capacity and faced with lay-offs when sales are down. 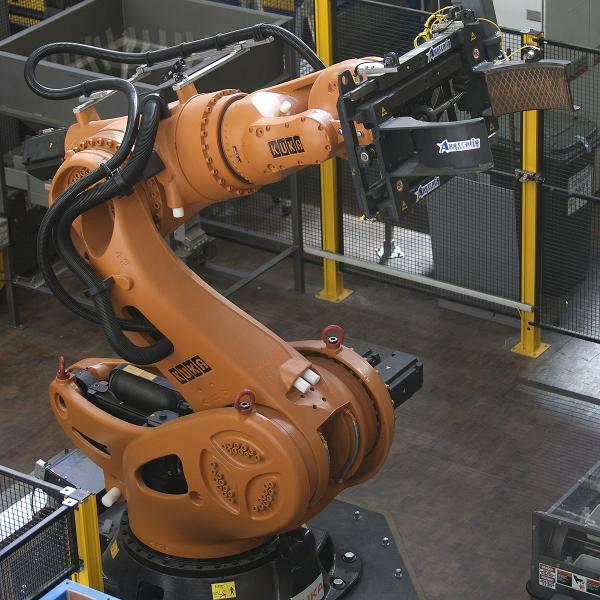 A robot palletizing system helps balance labor challenges in dealing with business cycles. Also, companies faced with production backlogs or shortages tend to balance this challenge by increasing inventory. Automating with a robot palletizing system helps balance a production line and thus, assists with reducing inventory. Any company that manufactures heavy, bulky items or smaller high-volumes products with multiple shifts will benefit by implementing a robot palletizing system. The manual process of handling products greater than 50 pounds, palletizing at fast rates for long periods, or stacking product above the head leaves opportunity for personal injury. For extremely heavy products, robot suppliers like Kuka Robotics provides palletizing robots capable of payloads up to 2000lbs. Some products are manufactured in extreme environments where exposure to injury is high, like metal stamping and forging operations. A robot system can mitigate these risks, as well as others that may be specific to your operation. Reducing operational cost may be the ultimate goal; however, the true benefit with a robot system is improving multiple measures at one time. When considering a robot system, companies should evaluate reducing operation expenses and increasing manufacturing flexibility and increasing throughput with a balanced production system. Companies with high-volume production, bulky/heavy products, multi-product handling needs, unbalance production lines, and needing increased focus on safety should consider the benefits of a robot palletizing system. Contact us today at 972-271-5203, x30, or sales@robotsystemsllc.com for a free automation assessment, and let us show you the advantages that a robot palletizing system can provide for you.